Feds issue 4,000 orders to seize guns from people who failed background checks. 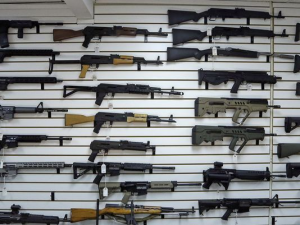 WASHINGTON— Federal authorities sought to take back guns from thousands of people the background check system should have blocked from buying weapons because they had criminal records, mental health issues or other problems that would disqualify them. It’s the largest number of such retrieval requests in 10 years, according to FBI records – an especially striking statistic after revelations that a breakdown in the background check system allowed a troubled Air Force veteran to buy a rifle later used to kill 26 worshipers at a Texas church last month. The FBI’s National Instant Criminal Background Check System (NICS) vets millions of gun purchase transactions every year. But the thousands of gun seizure requests highlight persistent problems in a system where analysts must complete background checks within three days of the proposed purchase. If the background check is not complete within the 72-hour time limit, federal law allows the sale to go forward. ATF agents are asked to take back the guns if the FBI later finds these sales should have been denied. In addition to the public safety risks, the ATF agents tasked with retrieving the banned weapons from unauthorized gun owners across the country are exposed to potentially dangerous confrontations. It was not immediately clear how many gun seizure requests agents successfully executed last year or how many weapons were ultimately recovered. Since multiple firearms can be purchased in a single transaction, the actual number of guns that should have been banned could be even higher. Stephen Morris, a former assistant FBI director, said FBI examiners who review gun purchasers’ backgrounds also recognize the risks. “They are very aware of the inherent risk to law enforcement officers when they (seek) a firearm retrieval,” said Morris, who recently oversaw the bureau’s background check operation based in West Virginia. “They feel tremendous pressure to make a determination” within the three-day period.